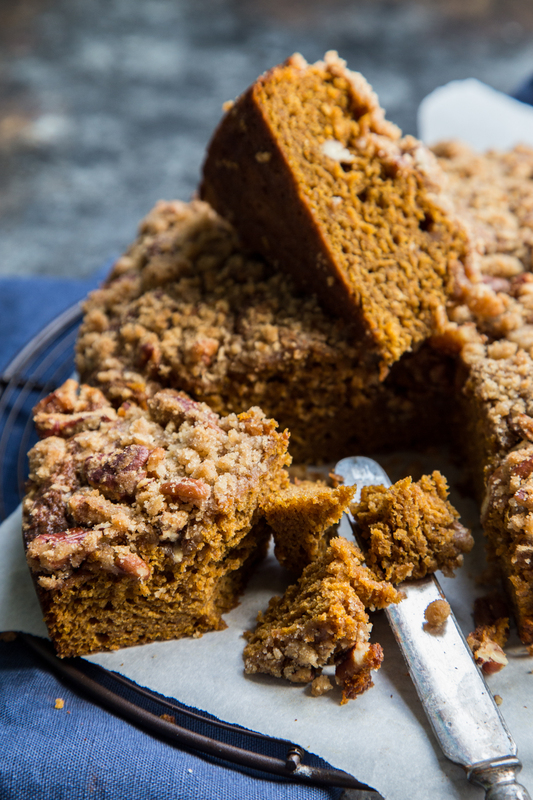 Bring the fall and holiday season to your table with this mash up of pumpkin and gingerbread! 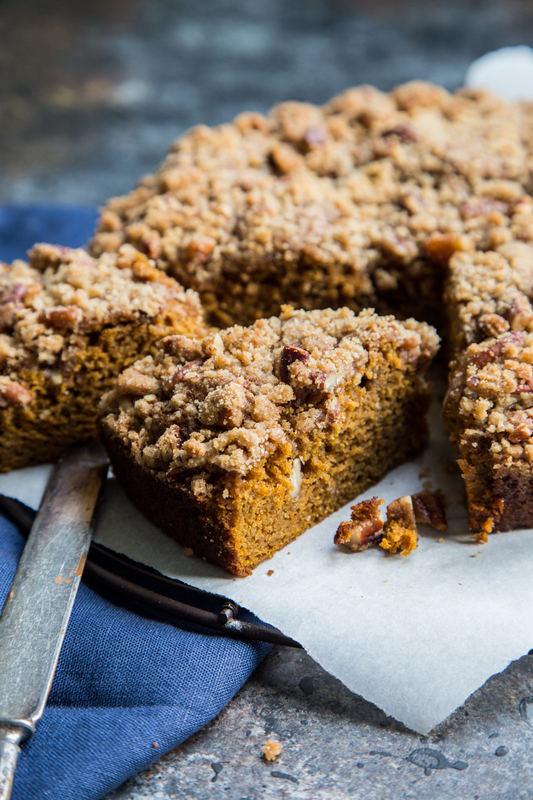 This pumpkin gingerbread coffee cake has the best of two worlds, and makes two cakes for a crowd. You can also make them and freeze one so it’s ready to bake when a craving strikes! There are several things you learn about late pregnancy that are very tough lessons. At 36 weeks, you will no longer be able to tie your shoes. That pen you dropped last week, well, just pretend it no longer exists because it’s in the same place you dropped it. It’s gone forever. And trying to get ready in a timely manner is a thing of the past, especially when you combine being freshly showered and your favorite jeans are straight out of the dryer. They will meet their untimely demise. This weekend my wonderful, caring, lovely, thoughtful, and out of this world friends threw me and the kiddo a baby shower and we were absolutely blown away with all the love that surrounded us. I’ll be sharing more about it this week with photos of the country and nature themed shower. It was me in every possible way. I’ll tell you now that mason jars and woodland creatures featured heavily in the decor. It makes me giddy! With all the excitement of the day, and two of my best friends driving and flying in from other states, I was a little overly anxious to get dressed and ready to maximize the time I was going to get to spend with them. Like you do. Ben and I had spent the morning getting the house cleaned up and ready, shopping for his Huggies and Chuggies portion of the day – which was football, beer, and diapers with the dudes – and getting the house ready to be seen by everyone in our lives! Having been here for three months, this whole event was the equivalent of a house warming and baby welcoming party! This house may never see so many people in it again, but it was absolutely lovely to have it happen all at once. ANYWAY! Once the shopping, cleaning, cooling down of beers was done, I needed a shower. And as the universe always works, as soon as I got out of the shower the doorbell rang with my best friend Sara arriving at the house. Dripping wet and unable to answer the door, Ben was on welcoming duty. Frantically I toweled off, fanned myself off and wished I had a Hollywood movie sized fan in my bedroom to blow away the residual moisture from whatever extra hydrating body wash I grabbed in the shower. The bane of tight, freshly washed jeans everywhere. So as I ran around the bedroom finding my favorite maternity capris – white, even though it’s after Labor Day, and ones that don’t give you a saggy bottom look walking from room to room – I teetered one foot and then the other into the legs of the pants, found the two belt loops on the side (presumably only there to help pull them on – because there is no point in trying to belt your pants anymore…), and got them above my knees. Almost there! But as they crawled up to my hips I made that disastrous mistake of…. bending my knees. At that very moment the jeans made it over my hips, and a sound to crush all pregnant women’s hopes and dreams echoed through my room – RIPPPPPP!!! Everything stopped. I looked down, over the belly, and found the unsightly rip right in the middle of the crotch. How bad was it? Could I still wear them? Could they be mended? Guess it’s time to bust out that sewing machine my mom got me 6 years ago… Oh, no. It’s really THAT bad. By all accounts, no. They were dead. Gone. And only three weeks to go to the end of this pregnancy. I am crushed. But we rallied. I found another pair of jeans to help get me through and the whole day was so much better than the one pair of jeans that met their demise. Surrounded by family and friends-that-are-family, we are ready to welcome the little Tater Tot to our tribe. And he is so incredibly loved already. What more could we ask for? The other thing I am most thankful for is that it also RAINED this weekend in Seattle. It felt like fall is properly in the air, and we can breathe! The fires raging all over the west have cast the most heavy smoke over everything the last month and a half making my nightly dog walks impossible. For part of the party, Ben, myself and a few of our friends just sat on the deck in camp chairs in the drizzling rain enjoying every droplet that fell. And with that it also means that pumpkin recipes are here to stay!! 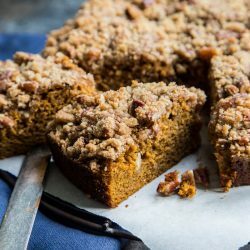 This pumpkin gingerbread coffee cake was absolutely devoured by everyone at work, and it is definitely my new favorite. 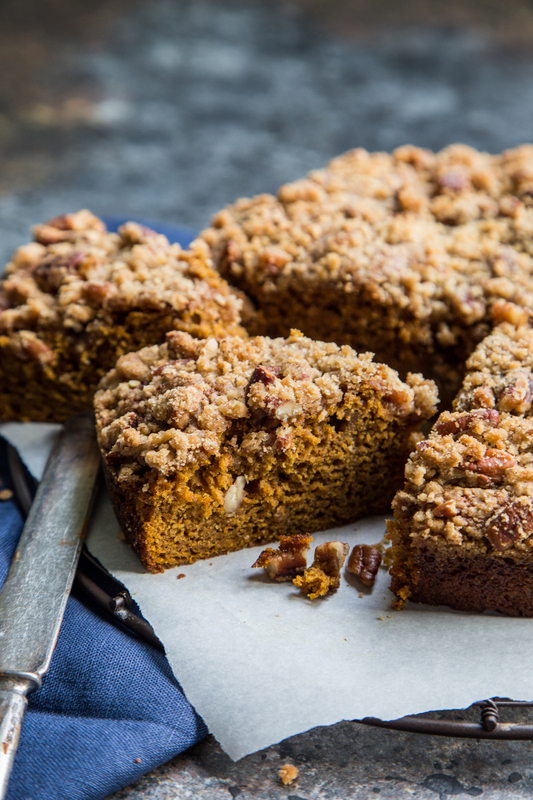 It’s dense, but tender, with a perfect balance of pumpkin spice and gingerbread flavors. It’s not gummy like some coffee cakes can be, and it makes TWO cakes. As part of the preparations for the kid, I made this one and froze another to bake fresh when he arrives and all I am able to do is snuggle him. In a large bowl combine all the ingredients. Using your fingers mash the ingredients together until the butter is nearly completely incorporated and the sugars look like wet, chunky sand. 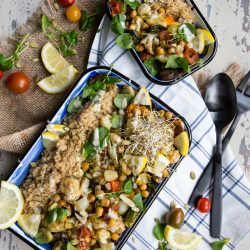 Set aside, or place in the fridge until ready to use. 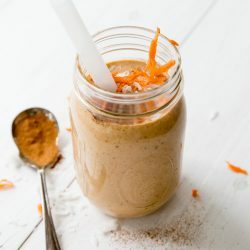 In a large bowl, whisk together the flour, baking powder, baking soda, pumpkin pie spice, cinnamon, ground pepper, and salt. Set aside. In another large bowl, whisk together the pumpkin puree, molasses, brown and white sugar, eggs, and butter. Using a spatula, fold the flour mixture into the wet mixture until the mixture is nearly combined. There should be a couple of small streaks of flour left – that way you know you haven’t over mixed it. Pour into two lightly greased or sprayed 9 inch cake pans. Spread out the cake out and smooth the tops. 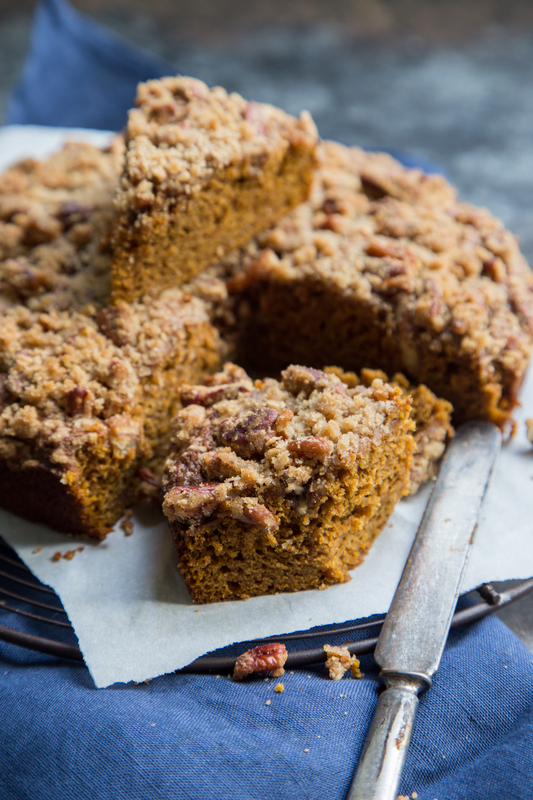 Sprinkle the pecan crumble over the top of each cake. Bake the cake for 25-30 minutes or until a toothpick placed in the center comes out nearly clean, with a couple of crumbs on it. Place on a wire rack to cool. Serve just warm. Pumpkin AND gingerbread?! This is totally my dream food…gimme a slice with a cup of coffee and I’m set! Bring on fall! And I’ll give some new pants in exchange for this cake. Deal? 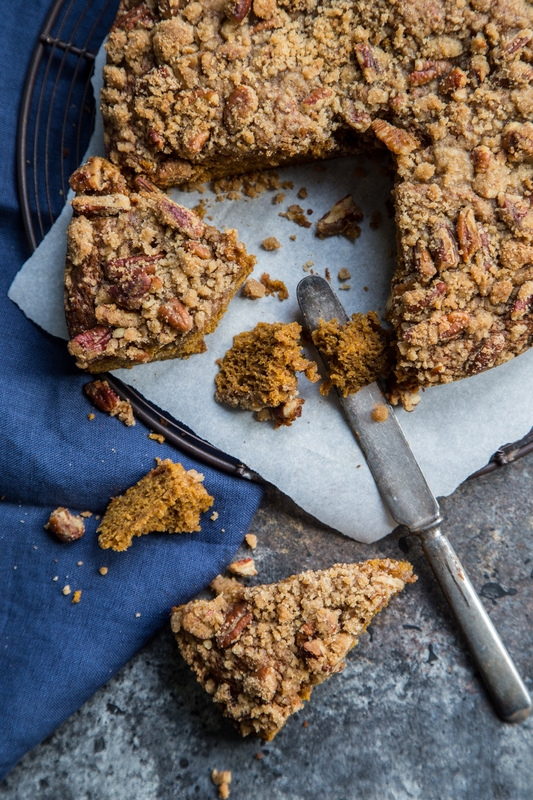 What a beautiful coffee cake – that crumble is the clincher for me! It’s the strangest thing, isn’t it, not being able to tie your shoes?!?! 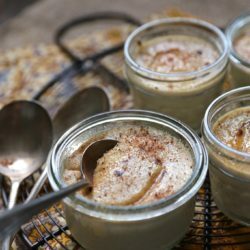 I just KNOW you and all the boys would LOVE this recipe!! Sending all my love! XOXO! 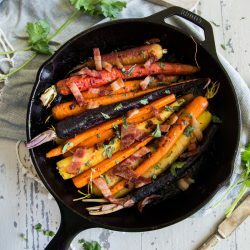 Would this recipe work in mini bread loaf pans? I just baked this recipe for a Christmas Eve party. I had to sneak a piece because it smelled so good (my husband kept commenting on how good the kitchen smelled), and it sure is delicious! I’m sure it’s going to be a hit at the party. 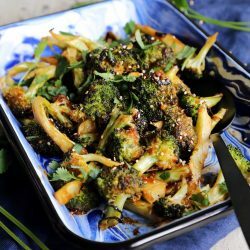 Is there no ginger in this recipe? I see gingerbread in the name, but not in the ingredients. Is it just the ginger in the pumpkin pie spice? Super looking forward to making this! Whitney, yes the ginger comes from the pumpkin pie spice! Sorry for the confusion! But if you love ginger, by all means, add in some dried ground ginger, 1/4 tsp would be a nice add! !